Skin-compatible adhesive made of natural resins: convenient MASKWORLD brush-on Mastix. Use MASKWORLD Mastix remover to quickly remove any trace of Mastix from your skin. 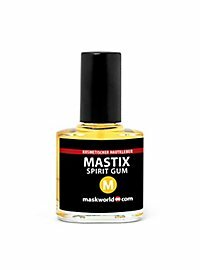 MASKWORLD Mastix spirit gum is "Made in Germany" and can be used up to 12 months after opening. Very effective keeping facial hair make-up in place. Easy to use.